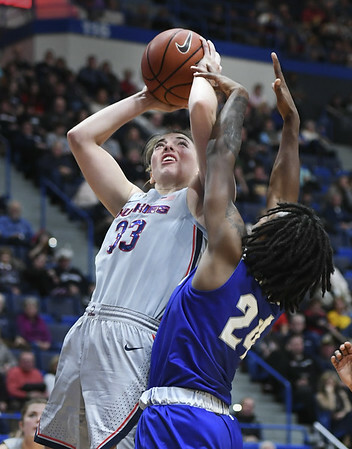 HARTFORD - For all the awards and accolades Katie Lou Samuelson has compiled over the years, there are a couple of pieces of paper at her Huntington Beach, California, home she takes pride in. The UConn women’s basketball team’s two-time All-American and two-time AAC Player of the Year has been named to the league’s academic all-star the last two years and has the certificates from the league to prove it. Last Friday, she attended her last class at UConn. When she finishes her final exam in sociology this coming Saturday, she’ll have completed the requirements for her bachelor’s degree with a major in human development and family studies. But she’s not going anywhere yet as there’s more to get done. The senior guard had a season high 26 points and a career high 16 rebounds for her second double-double as the top-ranked Huskies rolled past Seton Hall 99-61 at the XL Center on Saturday. She also made four 3-pointers to pass Diana Taurasi and move into second place on UConn’s all-time list. Earlier in the week, she passed Maya Moore. With 320 treys, Samuelson trails only fellow Mater Dei High graduate Kaleena Mosqueda-Lewis (398). “I’m proud to have gotten the opportunity to play here and now set myself up there with these players,” Samuelson said. Sure she’s taken advantage of her opportunity on the court. She’s also made sure she’s taken advantage of the opportunities given to her in the classroom. “Being a student-athlete is hard,” she said. “I don’t think people understand, necessarily, how hard it is and everything you have to do to prepare yourself for it and get through it. Samuelson will be taking online courses in the spring to maintain her eligibility. But the days of waking up for 8 a.m. classes are done and left to her teammates and classmates. The importance of the academic side of her life has always been stressed by her parents, Jon and Karen. Samuelson’s older sisters - Bonnie and Karlie - not only played at Stanford, they graduated with degrees in one of the school’s most difficult majors, human biology. Bonnie is now in her third year of four at Southern California College of Optometry in Fullerton. Karlie is playing professionally in Belgium for Royal Castors Braine after completing her rookie year with the WNBA’s Los Angeles Sparks and is taking online classes for her master’s degree. The third Samuelson could have followed her sisters to Stanford but chose UConn for not just athletic reasons. Academic success is nothing new for the Huskies under coach Geno Auriemma. Every player who completed her eligibility at UConn in Auriemma’s tenure has graduated. Samuelson and fellow senior Napheesa Collier will add to that total. Collier, like her classmate, will receive her bachelor’s degree in human development and family studies. While they are both projected to be first-round WNBA draft picks, they would like to add on UConn’s 12th national championship. Samuelson’s double-double to go with her first from last year’s NCAA Tournament first-round win over Saint Francis puts her season numbers at 20.1 points, 7.1 rebounds, and 4.2 assists with an assist-to-turnover ratio of 3.8. But even a 21-year-old knows that hoops don’t last forever. Whatever she decides, Samuelson will do it the way she has done it at UConn - with class. Posted in The Bristol Press, UConn on Monday, 10 December 2018 20:54. Updated: Monday, 10 December 2018 20:56.